Do you have any tips to help my weight loss? The below dietary advice can help to maximise your weight loss results when using Nutribuddy products. Remember weight loss comes from achieving a calorie deficit. I.e. you must be burning off more calories that you are taking in. Nutribuddy products along with the general guidance below will help you to achieve this in both an enjoyable and healthy way. The most important tip is to try your best to stick to just your 3 meals per day. Breakfast should be your largest meal. This should give you the energy to power through the day and you shouldn’t be as hungry come lunch-time and shouldn’t snack. Lunch should be slightly smaller than breakfast and dinner should be smaller than lunch. It’s important that dinner is your smallest meal as you don’t have time to burn it off before you go to bed and you’re not burning off your meal whilst you sleep. This is surprising, but water actually helps curb cravings. It’s great as well because it keeps you hydrated so it helps your overall health and not just weight loss. So it’s great, you get full but don’t feel guilty about calories. If you really need a snack then Nutribuddy Hotslim is a sweet and filling yet low fat option. Also a piece of fruit is a good choice but try not to fill yourself up on fruit. It contains quite a bit of natural sugar. Weigh yourself in the morning. You’re always going to weigh more in the evening so if you weigh yourself in the morning one week and then the evening the next, it may look like you have gained weight when you haven’t. 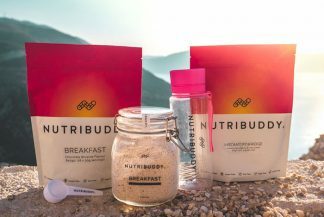 Previous post: If I stop taking Nutribuddy, will I gain the weight back? Next post: How to I update my card details on a subscription?